Being more of a night owl than an early bird, there are quite a few things that I never get to see, such as, oh, say, the sunrise. It's not that I don't like to get up early, it's really more that I just can't. Even after having gone through several phases where I desperately wanted to be an early riser, and would set the clock for some optimistic time only to hit the snooze button so many times that I would inevitably get up even later than if the experiment had not been tried at all! Early mornings are just not how I'm programmed. The Mister, on the other hand, is a natural early riser. He bounds out of bed with big plans in his head and taunts me with the phrase "Time to milk the cows!" But since we've changed the clocks back, and the early morning light is suddenly filtering through our windows at a time that makes it seem later than it actually is, I've had the opportunity to not exactly get up with the roosters, but wake up early and see some rare autumn morning blessings. 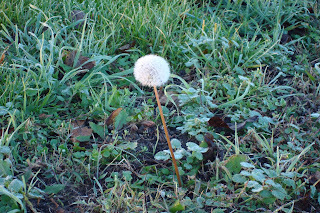 For instance, I was startled to see this lone (and thawing) dandelion puff standing prominently against some early morning patchy frost. It was the only one left, and maybe the last one for the year. 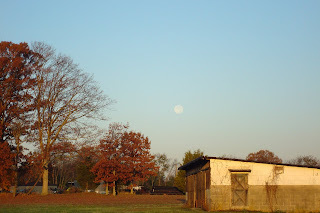 And then there was the early morning moon which was setting on one side as the sun came up on the other. I only see the moon at night, so this was a novelty. Such a lovely blue sky, too. Beat together with mixer. Pour into pie shell and bake at 350 for 50 minutes, until middle is set. Have mercy! We thought it was a defunct utility pole! I too saw all the sunrises this week. But I have also gone to bed around 10PM. Give me another week or so and I will be a midnight person again. 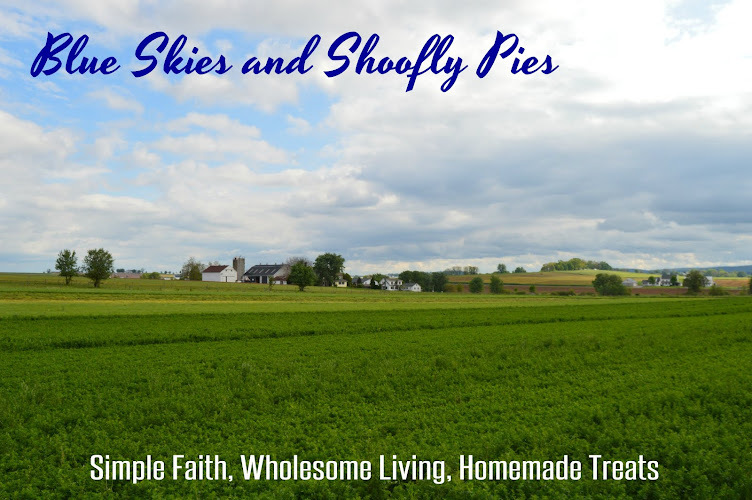 That pie sounds so good. i am not an early riser myself. I tease that i would enjoy mornings more if they started at noon! truthfully, i am up around eight to nine. Hi Monica it seems forever since I was here. Since surgery I would go on computer and off again. 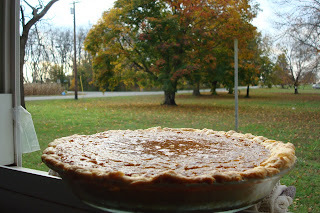 Now I'm on pretty much all the time again.. Pumpkin pecan pie sounds good yummy! I never made one of them. I might have to try it.. Thanks for sharing. I have so much to read on your blog I like the idea of cooling a pie on the window . Well I'm a morning person the alarm goes off at 3:30 AM we don't miss anything..